I always enjoy looking at an artist’s original pencil artwork before it is inked. It’s fascinating to examine how much the image changes. Of course, the before and after difference varies from artist to artist. 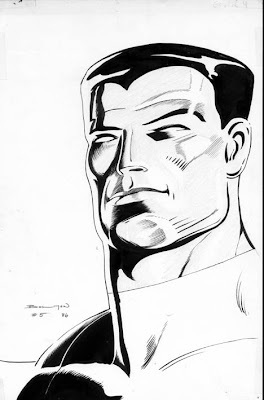 For instance, compare the pencils and inks in the artwork below by John Bolton. His portrait of Colossus (from Classic X-Men #5‘s back cover) is radically different from inception to finished product. 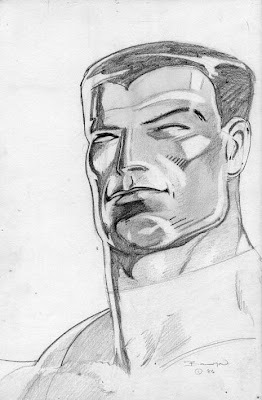 In this pencil drawing, Bolton explores the planes on Piotr’s face leaving no contour undiscovered. The differences in line darkness, shading and gray tones add dimension to the portrait. In the inked version the gray tones are gone, leaving only the basic design. All of the exploratory linework prepared the way for this clean, concise and robust image. It’s important to mention that this art is from 1987. John Bolton has created a prolific artist portfolio since his time on Classic X-Men. One would expect that his artistic process has evolved quite a bit since this time. However, his work from his X-Men era certainly holds up as classic design. For more John Bolton artwork check out his website or comicartfans.